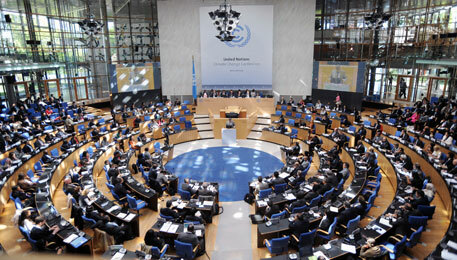 The second session of the ADP, acronym for Ad hoc Working Group on Durban Platform, began in Bonn on April 29, 2013. At the opening session, countries outlined their positions on what they expect of the global deal on climate change, to be decided in 2015 and which will be implemented from 2020 (see box: Country positions). The ADP, which was launched at the Durban Conference of Parties in 2011 to develop a protocol, a legal instrument or an agreed outcome with legal force, is to complete its work by 2015. Work to fulfill this commitment is under work-stream I of the ADP. The second work-steam of the ADP deals with enhancing mitigation ambition to close the ambition gap until 2020. Reiterating the fact that the world is losing precious time, UNFCCC executive secretary Christiana Figueres said the world is edging towards global atmospheric carbon dioxide concentrations of 400 parts per million. Last week, the Scripps Institution of Oceanography recorded close to 400 ppm at the Mauna Loa recording station in Hawaii. The institution estimates that if not this year, the 400 ppm mark will definitely be broken next year. This is cause for concern since climate scientists have maintained that carbon dioxide concentrations need to be kept below 350 ppm to keep average temperature rise below 2°C. Anything exceeding that could lead to catastrophic climate change. “One-third of the time allotted to the ADP is gone and the rest of the time must be used wisely,” Figueres added. But there is a whole history of 20 years of climate change negotiations—and inaction on the part of the developed world to cut greenhouse gas emissions. The fight essentially has been over who will cut emissions and how much. While the principles of the equity and CBDR, enshrined in the Convention, make it mandatory for the developed world or Annex I countries to take emissions reduction, they have either taken little action or their actions have not proved enough to check temperature rise. For instance, it had been agreed at the Bali climate conference in 2007 that the developed world needed to cut 45 per cent greenhouse gas emissions below 1990 levels by 2020 to keep average temperature increase within 2°C. Kyoto Parties would do this by increasing their levels of ambition and non-Kyoto parties, mainly the US, by cutting emissions at comparable levels. But at the Doha climate talks in 2012, as the first phase of Kyoto Protocol ended and the second phase began, the world faced the prospect of low ambition to reduce greenhouse gas emissions on the part of the developed world. “Developed countries must take the lead and increase the pre-2020 ambition. They must expedite efforts to close the ambition gap,” reiterated Fiji on behalf of the G77 and China group. Other developing countries also made it clear that the new global deal must not be interpreted as trying to rewrite the Convention and must be based on the principles of equity and CBDR. With respect to work-stream II, the demand was unanimous: the developed countries must increase ambition. These issues will be further deliberated through roundtables and workshops over the next five days to try to arrive at some sort of a consensus on the way ahead. We must close mitigation gap. Under work-stream I, we welcome the workshops and roundtables and under work-stream II, raising ambition is necessary and we must also focus on actions that offer real opportunity in the short-term, phase out of HFCs for instance. We need global regime that fosters national action. We have had useful conceptual discussions in the past, and now we need to deliver and need more focused discussions. We need an agreement that is applicable to all the parties. By 2015, we must adopt a legally binding agreement. We call for legally binding commitments under the same rules—CBDR and RC and equity. That is the key. We also need to close the ambition gap and increase action. For this we must look both within and outside the Convention. The time to act is rapidly slipping away. There is no other formal process to address climate other than this multilateral process. Failure means death for us. Under work-stream I, we need to define the structure and scope of the new deal. We must minimize impact and loss and damage. Adaptation is a very important issue for us. In the long run, mitigation will be the best form of adaptation; otherwise adaptation requirements will far exceed all support anyone can give. We are on the brink of new negotiations. Look at issues and linkages. CBDR and RC is a principle for action, not inaction. Combined action is the only hope. Many people in developing countries survive on less than what each cow receives in subsidies each day. This is the extent of inequity in the world. Developing countries have a right to sustainable development and eradicate poverty. Let us not reinterpret the Convention. The outcome should not be mitigation centric; it must contain all aspects emphasized since 2005. We also call on all sides to desist unilateral trade measures. ADP must take the Bali roadmap ahead. ADP is not to renegotiate, rewrite or reinterpret the Convention. Both work-streams are under the Convention, in particular equity and CBDR and RC. Developed countries must take the lead in finance, technology, capacity-building and support developing countries.